The operating system on the computer in the proshop for posting scores is no longer operative. To post your scores please use the GHIN website at http://www.ghin.com/ on your home computer or install the GHIN mobile app on your phone. From the (Post Scores) link type in your GHIN number and last name and post the score there. 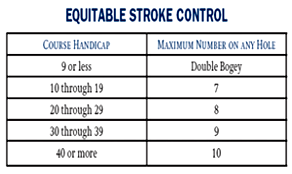 The ESC score is the maximum strokes for each hole based on your handicap as shown in the following table. The ESC scores are use when posting for handicap calculation and not for scoring an event competition. 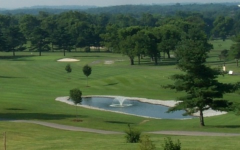 The 2019 golf season in Kentucky started March 1. It's now time to renew your membership and start posting your scores. To view changes to Club Championship Tournament play, open Club Championship link above. Handicap indexes are rounded up for calculating the playing handicap. Therefore, default tees are determined by the following. Index 7.4 and less will play from Gold tees; Index 7.5 thru 13.4 will play from the Blue tees; Index 13.5 thru 19.4 will play from the White tees; Index 19.5 and over will play from the Red tees. (last 9, 6, 3,1, holes): This is how USGA recommends to break ties when not using extra holes play off. If two players tie with scores, their last 9 scores will count as the tie breaker. If these two players are tied on the last 9, we will move onto the last 6, 3, and 1 hole(s) until we find a winner. If there still is no winner, then there will be a tie. To prevent duplicate TOURNAMENT SCORES do not post them yourself. The Tournament Management program will post them to GHIN for us. Members must play a minimum of two JHGA tournaments prior to the Club Championship to be eligible to compete for the "Club Champion" title. Notice to new members: Five scores are required to establish your true handicap. It is very important that you post all your scores, when played, in order to meet the minimum of 5 as soon as possible. If you need help to learn the posting system you should ask one of the officers or another member for assistance. The season to post scores for handicaps, from rounds played in Kentucky, begins March first and ends November 30. Scores from all rounds played should be posted. 2019 membership required. Remember, when posting a score that was played prior to the day you are posting it, be sure to set the "date" to the day the round was played. Do not post multiple rounds as bing played on the same day.